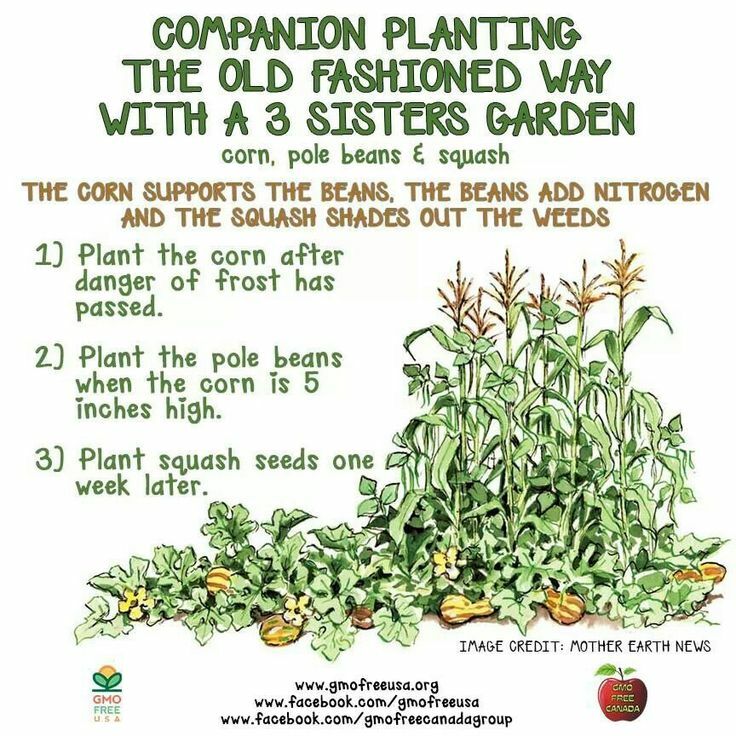 In a technique known as companion planting the three crops are planted close together. Flat-topped mounds of soil are built for each cluster of crops. Each mound is about 12 inches high and 20 inches wide. Several maize seeds are planted close together in the center of each mound. When the maize is 6 inches tall, beans and squash are planted around the maize, alternating between the two kinds of seeds. The development of this agricultural knowledge took place over 5,000–6,500 years. Squash was domesticated first, around 8,000-10,000 years ago, with maize second (at first consumed primarily in the form of popcorn), and then beans. The three crops benefit from each other. The maize provides a structure for the beans to climb, eliminating the need for poles or lattices which are more commonly used today. The beans provide the nitrogen to the soil that the other plants use, and the squash plant spreads along the ground, blocking the sunlight, helping prevent the establishment of weeds. The squash leaves also act as a “living mulch,” creating a microclimate to retain moisture in the soil, and the prickly hairs of the vine deter pests. Teotihuacan: The Place Where the Gods were Born: Who build these incredible ruins outside of present day Mexico City, which include one of the largest pyramids ever built anywhere? How did this mysterious civilization influence its neighbors and successors? The Aztec: Life Under the Fifth Sun in Old Mexico: A basic overview of the Aztec-Mexica, one of the final great civilizations to arise in the western hemisphere before the paradigm-shifting Columbian Exchange, including the dramatic ways in which they harnessed and changed the environment around them to grow their capital city into one of the largest in the world.